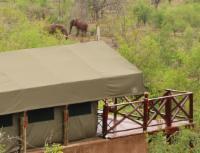 Mopaya Safari Lodge offers charming eco-friendly, 4 Star, exclusive, luxury safari accommodation. The popular lodge, situated between Hoedspruit and Phalaborwa in the province of Limpopo boasts a luxury tented camp with wooden decks overlooking the bush, minibars and bathrooms, plus two air-conditioned African huts with minibars and bathrooms. The lodge is well-stocked with an abundance of plains game such as Impala, Zebra, Wildebeest, Giraffe, Waterbuck, Duiker, Steenbuck, Kudu, Nyala, Warthog, Vervet monkey, Baboon, Jackal, Birds, and reptiles. Leopard, Cheetah and Hyenas come to hunt at Mopaya Safari Lodge on a regular basis, and also lions from time to time. The cuisine is excellent and abundant. Other features include an open bar, a 12-metre long swimming pool, lookout tower, optional horseback safari reserved to good riders, and private massages on request. Children are welcome from seven years of age, under the supervision of their parents. D3 TENTE DOUBLE Sleeps 2 Includes: All Meals and Activities DOUBLE TENT FOR 2 PEOPLE. 2 Lits simples, Terrasse, Salle de douche, Lavabo, WC, Ventilateur. D4 TENTE DOUBLE Sleeps 2 Includes: All Meals and Activities DOUBLE TENT FOR 2 PEOPLE. 1 Lit King Size, Terrasse, Salle de douche, Lavabo, WC, Ventilateur. D5 TENTE DOUBLE Sleeps 2 Includes: All Meals and Activities DOUBLE TENT FOR 2 PEOPLE. 1 Lit King Size, Terrasse, Salle de douche, Lavabo, WC, Ventilateur. D6 TENTE DOUBLE Sleeps 2 Includes: All Meals and Activities DOUBLE TENT FOR 2 PEOPLE. 2 Lits simples, Terrasse, Salle de douche, Lavabo, WC, Ventilateur. Mopaya Safari Lodge is 4km from the centre of Grietjie Nature Reserve , the nearest airport 36km (Eastgate Airport).